It’s Wednesday which means it’s time for another edition of the Fantasy Stock Market. You know the rules. The players that make the list can fall into one of two categories: The Straight Cash Homeys (The players on the rise) and The Mike Tyson Stock Portfolio (because honestly, how do you gross over $300 million in fights and wind up more than $10 million in debt?). After you check out the breakdown, I want your votes for who should be a Homey and who should be an Iron Mike. If this is your first time on the trading floor, I recommend you click the links to get brought up to speed. 1. Jonathan Stewart RB Carolina Panthers: One of Michael Lombardi’s favorite players entering 2008, Stewart burst onto the scene last week with a big time performance. Against a stingy Bears defense, Stew carried 14 times for 77 yards (5.5 YPC) and found pay dirt twice. This guy has the speed of a gazelle and the explosion of a freight train. With every carry, Stewart is slowly grabbing control of the starting job in Carolina. While he will still continue to split carries with DeAngelo Williams, look for Carolina to get him more involved in the offense. His stock is rising about as fast as Norv Turner’s blood pressure after the Hochuli call, so either get him in your lineup or look to acquire him before his value hits its ceiling. 2. 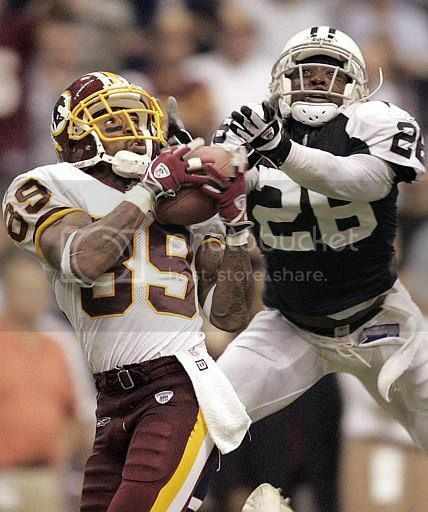 Santana Moss WR Washington Redskins: Out of all the great performances we saw in Week 2, nobody’s stock rose more than Santana Moss. Flash back to opening night where the New York Giants absolutely shut down the Washington offense. Quarterback Jason Campbell looked terrible and Moss’ numbers suffered as a result (5 catches, 37 yards, 7.4 YPR, 1 TD). Week 2 against New Orleans was a totally different story. Moss looked phenomenal catching 7 passes for 164 yards (23.4 YPR) and 1 touchdown. There is no better time to shop Santana Moss than right now. The Redskins won’t be lucky enough to face swiss cheese defenses like the New Orleans Saints every week. Campbell will come back down to Earth as opposing defensive coordinators figure out ways to put endless pressure on him. It’s time to strike while the iron’s hot. 3. Tony Scheffler TE Denver Broncos: Scheffler’s monster against the Broncos (6 catches, 64 yards, 2 touchdowns) was enough to give him the #1 ranking for fantasy tight ends after two weeks. Fantasy owners should be excited about the possibilities of the Denver offense this year. Jay Cutler looks dynamite (this kid was drafted the same year as Vince Young and Matt “Bust” Leinart. How do you think Tennessee and Arizona feel? ), Brandon Marshall had a huge first showing, and the Broncos still have 2 games to play against the sinking ship Chiefs. Cha Ching! This guy could very well be the top tight end at the end of the season. A pass happy offense and an athletic tight end are always a good combination. 1. Ricky Williams/Ronnie Brown RB Miami Dolphins: Could someone please tell me what is going on down in Miami? These two barely combine to make up one average running back, let alone two. Their COMBINED numbers through two games: 38 carries, 100 yards, 1 touchdown. Not exactly the stuff dreams are made of. Maybe the problem has something to do with the defenses they are playing. Jets and Cardinals? Nope, that can’t possibly be it. The good news is that there is still plenty of 2008 left to get something going. I actually saw Ricky Williams get dropped in one of my leagues. There has never been a better time to buy. Miami just needs some time. 2. Jeremy Shockey TE New Orleans Saints: This one stings because I was a big Shockey fan coming into the season. While I still intend to start him in all of my leagues, I can’t say I’m happy about how his 2008 campaign has started. Last week against the Redskins he caught only 2 passes for 22 lousy yards. As a fantasy bonus, he lost a fumble and ended up getting me 1 freakin’ point. On the year he has only 8 catches for 76 yards and has still yet to find the end zone. I could try to rip into this guy like I do with the other Iron Mike’s, but I’m afraid the man would destroy me. Go Saints! 3. Derek Anderson QB Cleveland Browns: Boy did this rags to riches story turn ugly quick. Never mind the Browns are 0-2 (both losses coming at home), but where the heck are the fantasy points? Anderson didn’t exactly win any owners their Week 2 matchups with his dreamy 166 yard, 2 INT showing against the Steelers. Yeah, I know, it was raining. Cry me a river. Meanwhile, the inability of the Cleveland offense to move the football is killing Braylon Edwards as well (him dropping passes isn’t helping either). Anderson has only thrown 1 TD pass this year and has a QB rating of 57.1. Dude better step up or the fans in Cleveland are going to start screaming for Brady Quinn (can’t imagine how that is going to help).